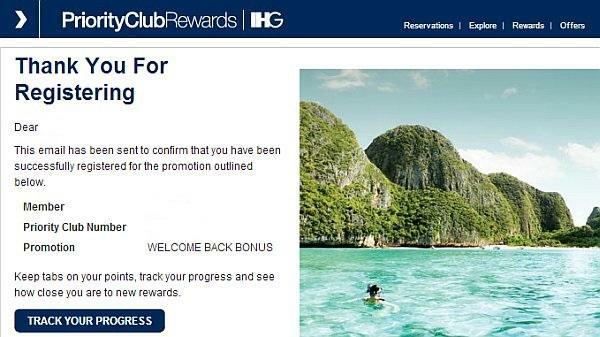 IHG Rewards Club has a new “Welcome Back” bonus offer for 1500 points for a qualifying stay within 90 days of registration. You can register for this promotion here. The promotional offer code for this Welcome Back Bonus is 2656. Note that this shouldn’t conflict with any of the previous bonuses, as my account that has taken advantage of all possible IHG Rewards Club bonus offers was eligible for it. Seems that we might see as many one time bonus offers in 2013, as we saw in 2013. Let’s just hope that there is a lot more to come. This bonus offer was first mentioned by a FlyerTalk on his/her post here.